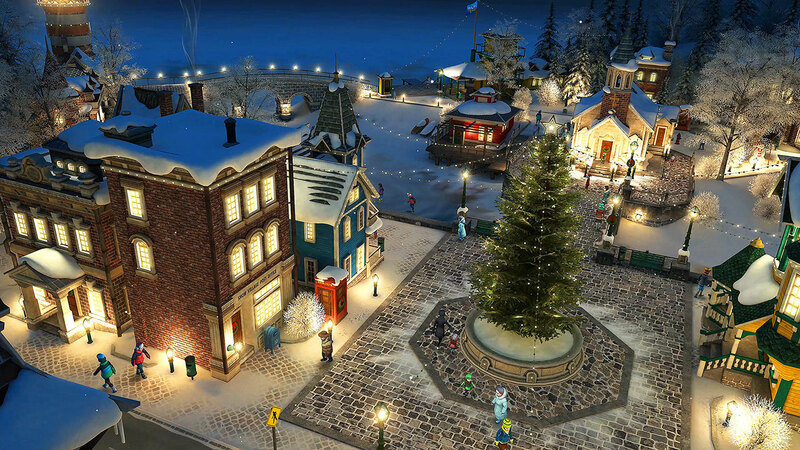 ﻿ Snow Village 3D screensaver – Enjoy the magic season with a whole village! 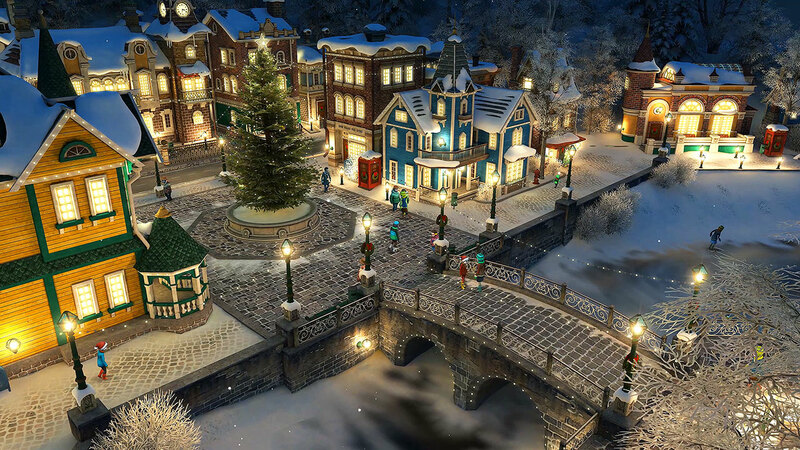 Download this 3D screensaver and get transformed into a village surrounded by snow-covered beautiful forest. The paved paths are lit with lanterns and light from the windows. Light snow is falling from the night sky and the crescent moon on the dark sky gives the whole scene even more magic. You will slowly follow the frozen river, where kids small and big are skating their hearts out. 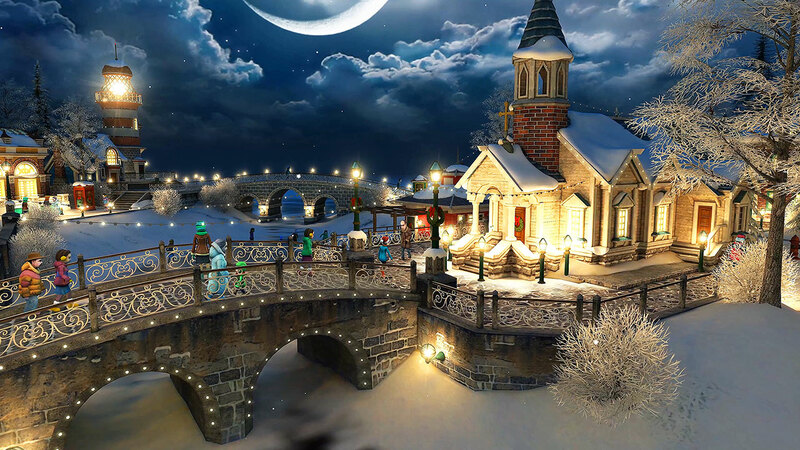 Meanwhile, the adults are enjoying a walk along the river, stop for pleasant little chats and cross the bridges lit with fun light garlands to go on the other side of the river to go home or visit their friends. In the center of the village, you will see a stunning Christmas tree decorated by all the villagers with love. And who can forgo decorating a tree for Christmas? This is such and easy beautiful way to bring happiness in the atmosphere no matter your age. Besides, practically everyone can get involved in the process, hanging the toys and garlands and maybe even create handmade decoration. A holiday is not only an abundant table and a decorated Christmas tree, but the very atmosphere of the celebration. If you have dressed up a Christmas tree, but it still seems to you that this is not enough to create a perfect atmosphere, do not stop there. Artificial snowflakes are also very much fun. You can decorate your stairs, fireplace and other areas of your home with garlands. Christmas light harmoniously look hung on the walls, windows and anywhere you like. Christmas wreaths of any size will add a beautiful touch to your front door and any room. This moving screensaver proves that a simple walk alone or in a company through the decorated streets of the city can be very much enjoyable, especially, if you are dressed warmly and comfortably. Preparing gifts is just as exciting and fun as receiving them.